Sorry, I just had to see them all laid out like that. Max Scherzer struck out 20 batters, tying the major league record for a nine-inning start, and he walked none. The hits don’t matter. The runs don’t matter. Twenty big league hitters went to the plate against Max Scherzer tonight doing everything in their power to make contact, and 20 big league hitters failed. Scherzer’s the fifth pitcher in major league history to strike out 20 in a nine-inning game, joining Kerry Wood, Randy Johnson, and Roger Clemens (x2). Interestingly, all five 20 strikeout games were without a walk. When you’re locked in, you’re locked in. He never needed more than 16 pitches to get through an inning. He touched 98 in the ninth. In traditional Scherzer fashion, he pounded the strike zone with his fastball, and against a Tigers lineup that featured seven right-handed batters, he used his slider like he’s never used his slider before. Scherzer threw 37 sliders, a career-high for a single game. The Tigers swung 21 times. They whiffed 10 of those times. 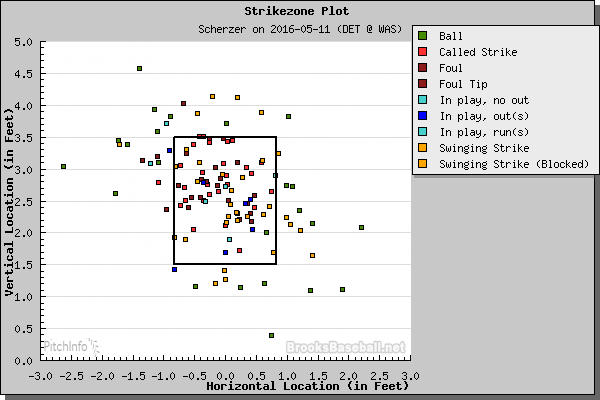 Scherzer didn’t need the cutter. He didn’t need the curve. He barely needed the changeup. When you’re as good as Max Scherzer was tonight, the fastball and the slider will do. He threw 119 pitches. Ninety-six of them were strikes. I’m going to show you a graphic to give you some time to digest that number, and we’ll revisit it momentarily. He threw 96 strikes in 119 pitches. 96! 119! If you’re wondering how nerdy stats handle outlier games like 20 K performances, Max Scherzer had a -0.14 xFIP tonight. Yes, negative. Scherzer knew who I was because of @fangraphs when I talked to him a few years back, which was cool. That’s my contribution for the night. Jonah Pemstein contributed to this post. We hoped you liked reading Max Scherzer Made History by August Fagerstrom!